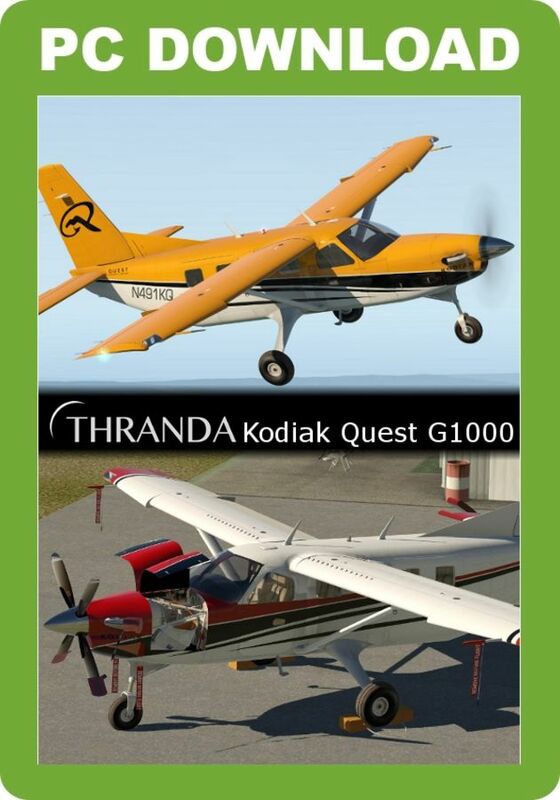 Exceptional model by Thranda (Dan Klaue) with Laminar-native G1000 and many new and exclusive features. The Quest Kodiak is the bush plane of the 21st century, capable of delivering payload or passengers in any part of the world! Auto updater for the duration of X-Plane 11! Dynamic Livery Editor - create your new livery while in the sim! Comprehensive menu with per-passenger Weight and Balance Manager, audio controls, custom slew controls, livery selection, aircraft configuration etc. Dynamic Livery generator - generate dozens of livery varieties within minutes! Extremely detailed panel with dynamic reflections on the panel material, G1000 glass, and steam gauge glass, which is also night-lighting responsive, and features Fresnel effect. Animated air conditioning gimbals throughout, which 'blow' sounds into the direction of the camera. Open cargo pod doors respond to prop wash or weather wind by oscillating back and forth. Over-torqued engine causes shaft break, prop loss, smoke in cockpit, chip in engine, alarms, terrifying sounds etc. Smoke in engine can be brought under control by killing the 'Firewall Air' via knob on panel. Adding cargo pod enables use of weight and balance manager to determine load. - Dynamic real-time weight-and-balance manager with full scroll support, metric/imperial switching, cargo pod option, ability to increase/decrease overall weight or shift balance, automatically re-calculating all loads etc. - Camera: select camera snap points visually, or use X-Plane's internal camera preset system, with an added visual interface. - Slew mode allows you to place your plane in real time in 3D, temporarily bypassing X-plane's aerodynamics. High fidelity, multi-track sounds, simulating multiple layers of engine and prop sounds, depending on camera angle, distance, atmospheric conditions etc. Different for front of plane vs. back of plane. Audio positioning is clearly discernible; move around the engine compartment and the sound origin clearly shifts depending on where the camera is pointing. Individual buttons and switches in the cockpit each have their own sound origin, which is mapped across the stereo spectrum. Yoke, throttle quadrant, brake handle etc. make friction sounds that are proportional to their movements, both in pitch and in volume. Individual brake sounds, tug motor sounds etc. 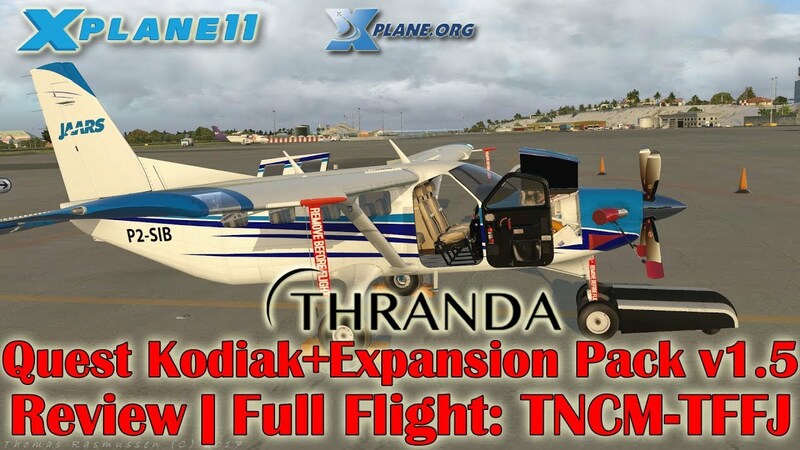 Thranda's Quest Kodiak for X-Plane 11 includes an accurate G1000 simulation with moving map, an exceptional array of advanced FMOD sounds, superb interior and exterior reflections using full PBR features, dynamic Livery Editor and a fly-out pop-up menu featuring five menus. Among the many features are a functional GPU, custom lighting throughout, accurate flight dynamics, extremely detailed panel with dynamic reflections, hideable cargo pod, engine failures and an electric tug to tow the aircraft.